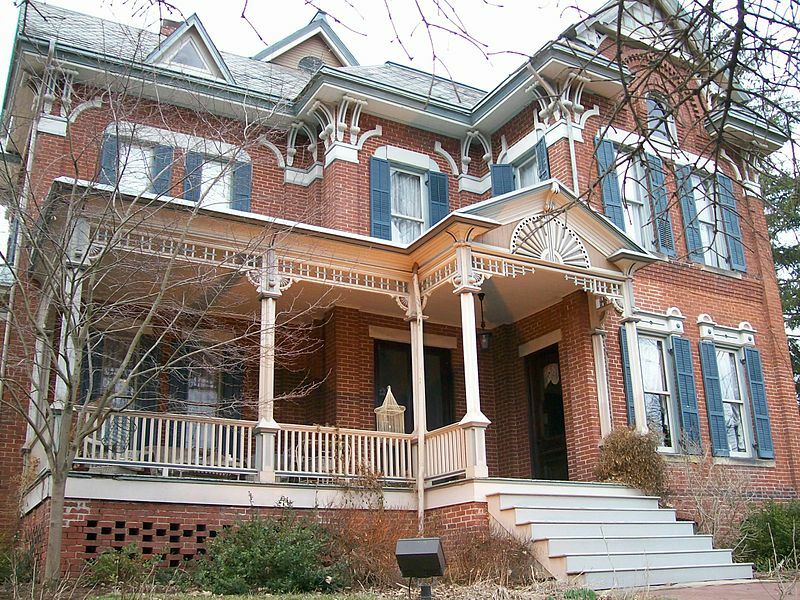 Brick streets and stately brick buildings are one of Marietta's defining characteristics. Brickmaking began in 1788 and continued almost without interruption until the 1930's. Native clay soil made the area a natural for brickmaking. The Ohio Company in 1788 authorized purchase of supplies, including bricks, for the block houses at the Campus Martius fortified stockade in Marietta. Bricks were used to build chimneys and beautiful homes as the new settlement grew. We'll explore the history of brickmaking in Marietta and some of the fascinating personalities involved. Brick streets will be discussed in a later blog post. The first bricks were "burned" by The Captain, Captain William Dana in 1788. Dana was a Revolutionary War officer who served with the Minutemen at Lexington in 1775 and commanded an artillery company. He suffered a financial loss due to the devaluation of continental currency and eventually relocated to Marietta in May of 1788 with his two sons. He was given permission to build a cabin near what is now Putnam and Front Streets. Captain Dana's son-in-law Joseph Barker paints the picture in his Recollections of the First Settlement of Ohio: "As it was too late to plant, he & the boys cleared a small piece...and made a small Kiln of Bricks which were probably the first Kiln of Bricks burnt in Ohio." Barker used the bricks to build a chimney for Captain Dana in Belpre and later transported some of the same bricks to build his own home up the Muskingum River at Wiseman's Bottom in 1795. Major Ezra Lunt also made bricks in the same location in 1789 and 1790. The Doctor was Nathan McIntosh was another adventuresome early leader with a connection to brickmaking. He was trained as a doctor in Boston and admitted to practice in 1786. In 1788 he decided to head west and set off for Marietta on horseback, only to fall ill with smallpox in Pennsylvania. He practiced medicine at Waterford, then Clarksburg, VA (now WV). The trip to Clarksburg was a challenge. The doctor travelled there with his wife and infant son, escorted by 15 militiamen. There were no roads or inns along the way, so they had to camp out at night. To keep the baby's crying from attracting Indians, it was dosed with paregoric and muffled with a handkerchief to suppress its cries. Dr. McIntosh built a large practice there and also embarked on a business venture to build a bridge across the Monongahela River. Soon after completion, the bridge was swept away in a flood, resulting in a large financial loss. He returned to Marietta and continued practicing medicine. He was renowned for his caring manner and surgical skill. He was also held strong religious views which he expressed in lectures and writing. In 1806 he started a brickyard and building brick houses. 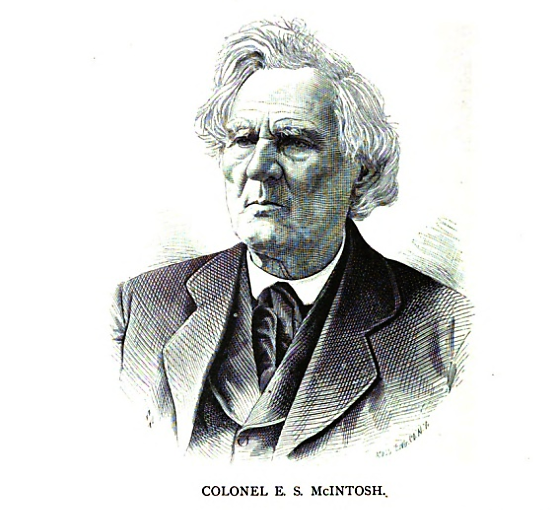 Dr. McIntosh's baby son - the one sheltered from the Indians - was named Enoch. He was born in 1793 and began working as a laborer in the brickyard at age nine and at age twelve began laying brick. Williams' History of Washington County, Ohio noted that "He thus early began a life of severe and unremitting toil, which occupied all his time until fortune rewarded his labors." and that "his capacity for work....was phenomenal." He build many beautiful brick homes in the area, including for Benjamin Putnam and Colonel John Mills in Marietta, Benjamin Dana, and Dr. John Baptiste Regnier. Regnier was one of the French immigrants who first settled at Gallipolis and later became a prominent doctor in Marietta. Enoch McIntosh left the brick trade in 1813 and became a successful businessman in the Beverly-Waterford area, operating a store, mill, and founding The First National Bank of Beverly. He lived to age 96 and was characterized in Williams' History as a "man of strong vital and moral force.......strong, robust......(who) in all his years never tasted intoxicating liquor or tobacco in any form." Brickmaking was apparently a good foundation, so to speak, for a long and productive life. Brickmaking became a boom industry in the late 1800's. Brick possessed much more strength and durability than other construction materials available at the time - and was fireproof. Demand surged for brick construction for residential, institutional, public works, and industrial buildings. A single large building could require a "ton of bricks." Construction of the state mental hospital in Athens, Ohio, for example, required 12 million bricks. In 1893, about 44 brick plants in Ohio alone were making 290 Million bricks per year. Thomas Cisler and Son located where the Frontier Shopping Center is today, just beyond the intersection of Seventh and Putnam Streets. Sterling Brick spread out along Montgomery Street between Seventh and Eighth Streets. The City Directories in the 1890's also listed brick makers Simon Zoller at Second and Montgomery Streets, L. W. Phillips at Eighth and Warren Streets, and James Cameron on Lord Street in Harmar. All except Zoller appear on the 1902 Atlas of the City of Marietta, Cram and Roe. More is written about Cisler than the others. Thomas Cisler was a first generation immigrant from Germany; the family name of Zeissler was later Americanized to Cisler for convenience. He started the brick works in 1856, and it grew into the city's largest by 1900. The expansive yard was spread over 25 acres. Cisler Brick complex copied by author from Century Review of Marietta, Ohio, Marietta, Ohio, Marietta Board of Trade, 1900. The Cisler home is in the background. He built an iconic home in 1886, which remains today, on a knoll overlooking the former site of the brick plant. The home featured terraced grounds, intricate woodworking, and ten rooms. It was the first in the area to have indoor plumbing and gas lighting. Click here to read an early account about the home just after it was built. Thomas Cisler was interviewed by the Marietta Times in 1890, just after he had installed a pressed brick machine. This machine compressed the bricks under 300 tons of pressure before they were placed for firing in the kiln. Clay for the bricks was taken from "College Hill" (site of the current middle school) which he had recently purchased from Marietta College. The 1902 tornado destroyed most of the Cisler brickworks (and Acme Brick in Norwood), though it apparently rebuilt the operation. The company closed for good the 1930's, after having been re-opened to make bricks for the "new" Marietta High School. It was built on the hill which also supplied the bricks for its construction. Thomas's son, Thomas Henry, also lived in the family home and had three children, one of whom was Miss Lillian E. Cisler. Miss Lillian was an eccentric spinster who lived in the home after her father's passing in 1950. She wore all-black clothing all the time as a sign of mourning for her late father, lived in spartan conditions (no car, no phone, utilities sometimes shut off) because of poor money management, was obsessive about continuing the traditions of her father - including an annual Bach music festival at the home, and became legendary for brazenly jumping into cars of people she knew while they were stopped in traffic and "asking" them to take her home. But she had a softer side, was intelligent and deeply religious. More about Miss Lillian in a future post. Sterling Brick was incorporated in 1899, owned by Marietta investors. It claimed a capacity of 30,000 bricks per day. Directors included D. R. Rood, T. H. Sugden. C. W. Sugden, F. P. Morse, C. L. Flanders, and Wm Morse. Acme Brick was given the longest write-up of the brick plants in the 1900 Century Review Board of Trade Edition. It was not yet in full operation at the time, but claimed capital stock of $50,000 ($1.2 Million in today's dollars), the latest equipment, and "indefinite" supply of shale and clay from soil at the site, a daily capacity of 30,000 brick and 25,000 shale shingles for roof tiles, and "six, tunnel dry houses...which will make.....production a success in rainy weather as well as sunshine." The roof shingles were superlatively described as "the most economical and as well as ornamental roofing that has been bought to us in modern times. The ruins of Pompeii is said to have disclosed it as a revival of a lost art." It's not clear whether the roof tiles and bricks lived up to the hype. L. W. Phillips operated a brick plant at Eighth and Warren Streets. His facility was not listed in the Board of Trade publication - maybe because he was not a member of the Board of Trade (predecessor organization to the Chamber of Commerce). But he did make the April 12, 1894 Marietta Register newspaper under the unflattering headline of "Geo. Phillips Imbibes too Freely and Raises Trouble Around His Father's House." reported solemnly that "George Phillips is not known as a vicious or ugly man when sober, and the above occurrence is due solely to an over indulgence in liquor. It is an unfortunate affair." It was an observation as true today as then. Brickmaking declined from its peak in the early 1900s as better alternative construction materials – such as steel – became available. The brick plants were all closed by 1930. Jobs and businesses supported by brickmaking soon faded away. Few remnants remain, having been removed by successor owners. The last feature at the Cisler plant, a stack for one of the kilns, came down more than 50 years ago when the Frontier Center was built. But thousands of local bricks remain in dozens of area homes and buildings, testimony to the once thriving brick industry. If those bricks could talk, they’d have many more stories to tell about the people who made them and used them. Atlas of the City of Marietta, Washington County, Ohio etc., Fred'k B. Roe, C. E., Supervisor, Chicago, IL, Geo. F. Cram & Co., 1902, viewed at historicmapworks.com. "Cisler Terrace a Gem in Downtown Marietta," The Marietta Times, April 10, 2015. The bricks on our home have the name C H KING imprinted in them. I didn’t see that name listed in your blog. We don’t know the exact year the House was built but it’s thought 1870s/1880s. Do you know if bricks would have been transported into town during this time period?